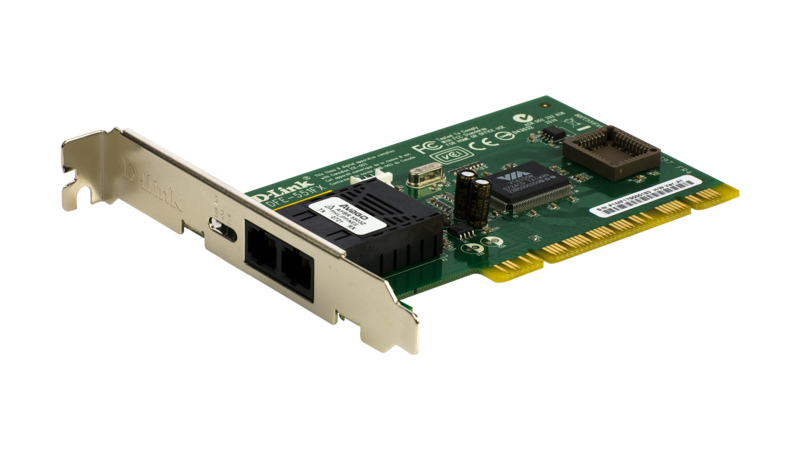 The DFE-551FX card allows you to establish secure fiber link for your PC. It can be used to set up a power workstation or a server with a direct fiber connection to a Fast Ethernet switch. Capable of running at 200Mbps fullduplex, this card serves well in a high electro-magnetic interference environment, providing a cable distance of up to 2 km to the switch. The card supports IEEE 802.1Q multiple Virtual LAN, allowing you to segment the network to smaller domains to improve performance and security. Dissemination of broadcast and unnecessary computer-to-computer packets can be restricted to reduce extraneous traffic. The card provides a VLAN table for the following functions: filtering packets by recognizing VLAN Tags, stripping VLAN Tags on receive, and inserting VLAN Tags on transmit. With packet prioritization capability, the card allows traffic to be queued as critical and non-critical, permitting your computer to run voice over IP, video-conference and multimedia applications where packets are delivered at best-effort speeds. 2 remote boot options are available for selection. Administrators can choose to set up a security scheme for diskless workstations to boot from servers using the traditional Remote Program Load (RPL) or Intel’s Preboot Execution Environment (PXE). Stations with boot ROMs installed on the on-board socket can boot O.S. from NetWare, NT and other servers to run applications designated by the administrator.